We have been quiet over the past couple weeks. Our bad. Some of us have taken vacation (I myself plan to travel to Seattle to attend PAX Prime this weekend, and sorry, but we are not previewing the game yet, but I hope we can exhibit the game in an event when possible.) Others have been quietly putting time into other assets needed to bolster content on the project. For instance, I have been putting a lot of time into Streets over the past couple months, but about three weeks ago, I formulated a solid strategy on recreating one level in particular. Today, I will show you some of the work; however, this is perhaps the only time anyone out there will be able to view this work, as these are collision bounds that will not be seen from in-game. 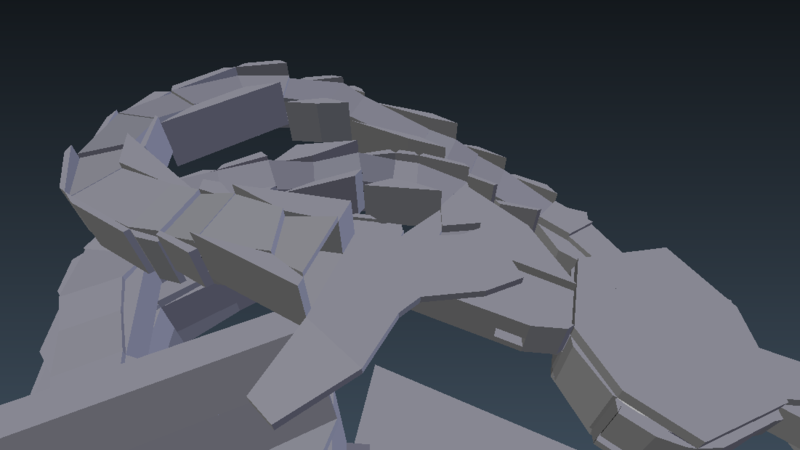 Now you may ask that this looks very blocky, and you would be correct. However, I decided to "work from the foundation" and create these bounds as close to the original geometry as possible. And so I have finished all bounds on the unique geometry, and are now planning the next course of action - beautifying the unique geometry. This will involve serious modification to said geometry, and also create new geometry and bounds to reflect something in nature to this map, the successor to it as a campaign level in the next game, and other pieces of work I or the original designer for the map has been inspired by. Well, I may have given away which map this is just from that last sentence, but I would like to see if anyone could shout it out in the comments. I was informed by Damian that he will be releasing a video soon on the progress he has made on his levels, so I will be posting those when they are ready. Also, we have had quite a few people apply to the team recently. Thank you, and we hope to find even more people to get this game out the door sooner! As a final word: 18 years ago, GoldenEye 64 was released to the masses and had kicked off the idea for a certain five individuals from Rare start their own game studio. From this came Free Radical Design, the guys mainly known for the TimeSplitters series. Back to Rare, though - congratulations on creating such a well-known and respected game, for telling the world that there is a console market for the shooter genre!